Discussions Magazine Music Blog: JUSTIN HAYWARD: An EXCLUSIVE interview! 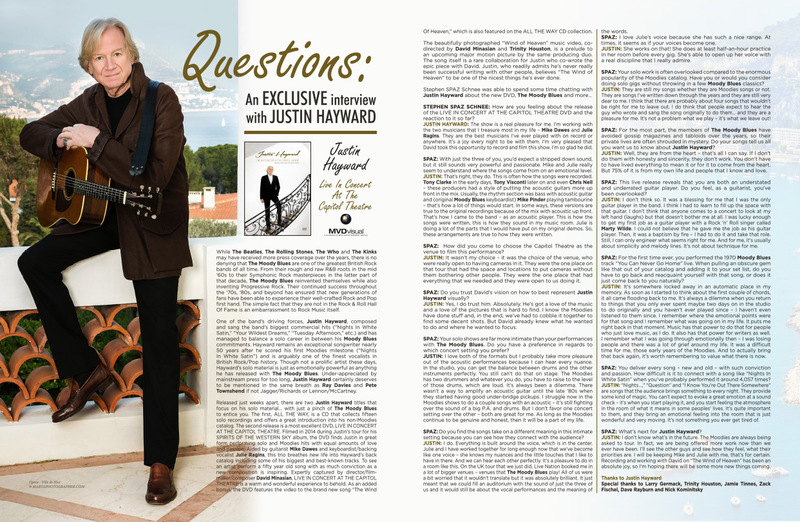 JUSTIN HAYWARD: An EXCLUSIVE interview! While The Beatles, The Rolling Stones, The Who and The Kinks may have received more press coverage over the years, there is no denying that The Moody Blues are one of the greatest British Rock bands of all time. From their rough and raw R&B roots in the mid ‘60s to their Symphonic Rock masterpieces in the latter part of that decade, The Moody Blues reinvented themselves while also inventing Progressive Rock. Their continued success throughout the ‘70s, ‘80s, and beyond has ensured that new generations of fans have been able to experience their well-crafted Rock and Pop first hand. The simple fact that they are not in the Rock & Roll Hall Of Fame is an embarrassment to Rock Music itself. 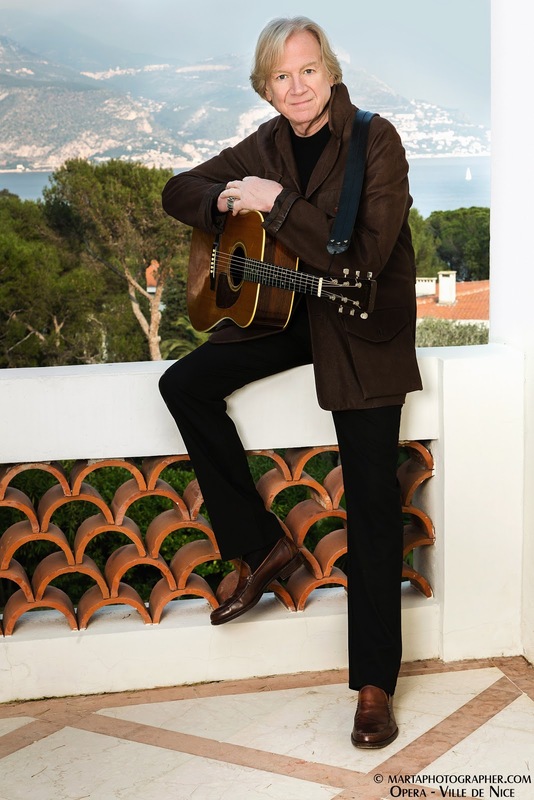 One of the band’s driving forces, Justin Hayward, composed and sang the band’s biggest commercial hits ("Nights In White Satin,” “Your Wildest Dreams,” “Tuesday Afternoon,” etc.) and has managed to balance a solo career in between his Moody Blues commitments. Hayward remains an exceptional songwriter nearly 50 years after he scored his first Moodies milestone (“Nights In White Satin”) and is arguably one of the finest vocalists in British Rock/Pop history. Though not a prolific artist these days, Hayward’s solo material is just as emotionally powerful as anything he has released with The Moody Blues. Under-appreciated by mainstream press for too long, Justin Hayward certainly deserves to be mentioned in the same breath as Ray Davies and Pete Townshend if not Jagger/Richards or Lennon/McCartney. Released just weeks apart, there are two Justin Hayward titles that focus on his solo material… with just a pinch of The Moody Blues to entice you. The first, ALL THE WAY, is a CD that collects fifteen solo recordings and offers a great introduction into his non-Moodies catalog. The second release is a most excellent DVD, LIVE IN CONCERT AT THE CAPITOL THEATRE. Filmed in 2014 during Justin’s tour for his SPIRITS OF THE WESTERN SKY album, the DVD finds Justin in great form performing solo and Moodies hits with equal amounts of love and passion. Aided by guitarist Mike Dawes and keyboardist/backing vocalist Julie Ragins, this trio breathes new life into Hayward’s back catalog including some of his biggest and best-known tracks. To see an artist perform a fifty year old song with as much conviction as a new composition is inspiring. Expertly captured by director/film-maker/composer David Minasian, LIVE IN CONCERT AT THE CAPITOL THEATRE is a warm and wonderful experience to behold. As an added bonus, the DVD features the video to the brand new song “The Wind Of Heaven,” which is also featured on the ALL THE WAY CD collection. The beautifully photographed "Wind of Heaven" music video, co-directed by David Minasian and Trinity Houston, is a prelude to an upcoming major motion picture by the same producing duo. The song itself is a rare collaboration for Justin who co-wrote the epic piece with David. Justin, who readily admits he's never really been successful writing with other people, believes "The Wind of Heaven" to be one of the nicest things he's ever done. STEPHEN SPAZ SCHNEE: How are you feeling about the release of the LIVE IN CONCERT AT THE CAPITOL THEATRE DVD and the reaction to it so far? 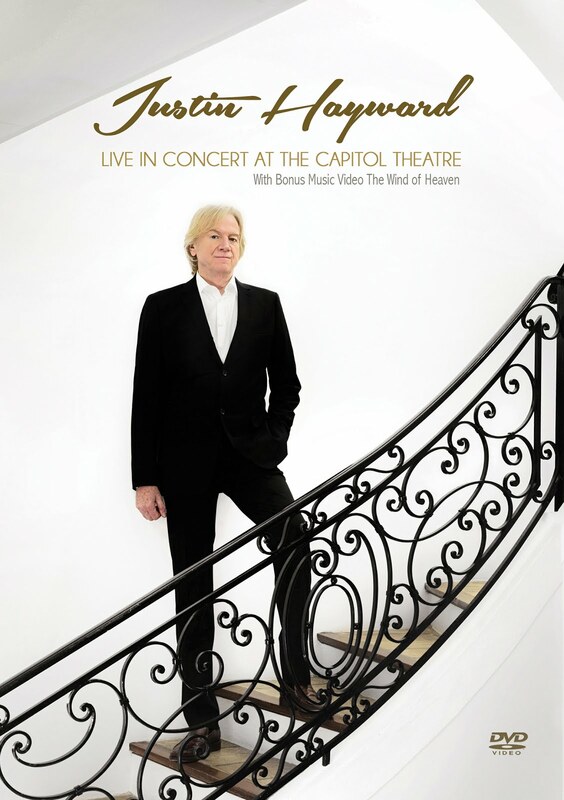 JUSTIN HAYWARD: The show is a real pleasure for me. I’m working with the two musicians that I treasure most in my life – Mike Dawes and Julie Ragins. They are the best musicians I’ve ever played with on record or anywhere. It’s a joy every night to be with them. I’m very pleased that David took this opportunity to record and film this show. I’m so glad he did. SPAZ: With just the three of you, you’d expect a stripped down sound, but it still sounds very powerful and passionate. Mike and Julie really seem to understand where the songs come from on an emotional level. JUSTIN: That’s right, they do. This is often how the songs were recorded. Tony Clarke in the early days, Tony Visconti later on and even Chris Neil – these producers had a style of putting the acoustic guitars more up front in the mix. Usually, the rhythm section was bass with acoustic guitar and (original Moody Blues keyboardist) Mike Pinder playing tambourine – that’s how a lot of things would start. In some ways, these versions are true to the original recordings because of the mix with acoustic up front. That’s how I came to the band – as an acoustic player. This is how the songs were written, this is how they sound in my music room. Julie is doing a lot of the parts that I would have put on my original demos. So, these arrangements are true to how they were written. SPAZ: How did you come to choose the CAPITOL Theatre as the venue to film this performance? JUSTIN: It wasn’t my choice – it was the choice of the venue, who were really open to having cameras in it. They were the one place on that tour that had the space and locations to put cameras without them bothering other people. They were the one place that had everything that we needed and they were open to us doing it. SPAZ: Do you trust David’s vision on how to best represent Justin Hayward visually? JUSTIN: Yes, I do trust him. Absolutely. He’s got a love of the music and a love of the pictures that is hard to find. I know the Moodies have done stuff and, in the end, we’ve had to cobble it together to find some decent shots. But David already knew what he wanted to do and where he wanted to focus. SPAZ: Your solo shows are far more intimate than your performances with The Moody Blues. Do you have a preference in regards to which concert setting you prefer? JUSTIN: I love both of the formats but I probably take more pleasure out of the acoustic performances because I can hear every nuance. In the studio, you can get the balance between drums and the other instruments perfectly. You still can’t do that on stage. The Moodies has two drummers and whatever you do, you have to raise to the level of those drums, which are loud. It’s always been a dilemma. There wasn’t a way to amplify an acoustic guitar until the late ‘80s when they started having good under-bridge pickups. I struggle now in the Moodies shows to do a couple songs with an acoustic – it’s still fighting over the sound of a big P.A. and drums. But I don’t favor one concert setting over the other – both are great for me. As long as the Moodies continue to be genuine and honest, then it will be a part of my life. SPAZ: Do you find the songs take on a different meaning in this intimate setting because you can see how they connect with the audience? JUSTIN: I do. Everything is built around the voice, which is in the center. Julie and I have worked together for long enough now that we’ve become like one voice – she knows my nuances and the little touches that I like to have in there. And we can hear each other perfectly. It’s a pleasure to do in a room like this. On the UK tour that we just did, Live Nation booked me in a lot of bigger venues – venues that The Moody Blues play! All of us were a bit worried that it wouldn’t translate but it was absolutely brilliant. It just meant that we could fill an auditorium with the sound of just the three of us and it would still be about the vocal performances and the meaning of the words. SPAZ: I love Julie’s voice because she has such a nice range. At times, it seems as if your voices become one. JUSTIN: She works on that! She does at least half-an-hour practice in her room before every gig. She’s able to open up her voice with a real discipline that I really admire. SPAZ: Your solo work is often overlooked compared to the enormous popularity of the Moodies catalog. Have you or would you consider doing solo gigs without throwing in a few Moody Blues classics? JUSTIN: They are still my songs whether they are Moodies songs or not. They are songs I’ve written down through the years and they are still very dear to me. I think that there are probably about four songs that wouldn’t be right for me to leave out. I do think that people expect to hear the guy who wrote and sang the song originally to do them… and they are a pleasure for me. It’s not a problem what we play – it’s what we leave out! SPAZ: For the most part, the members of The Moody Blues have avoided gossip magazines and tabloids over the years, so their private lives are often shrouded in mystery. Do your songs tell us all you want us to know about Justin Hayward? JUSTIN: Well, they are from the heart – that’s all I can say. If I don’t do them with honesty and sincerity, they don’t work. You don’t have to have lived everything to mean it or for it to come from the heart. But 75% of it is from my own life and people that I know and love. SPAZ: This live release reveals that you are both an understated and underrated guitar player. Do you feel, as a guitarist, you’ve been overlooked? JUSTIN: I don’t think so. It was a blessing for me that I was the only guitar player in the band. I think I had to learn to fill up the space with that guitar. I don’t think that anyone comes to a concert to look at my left hand (laughs) but that doesn’t bother me at all. I was lucky enough to get my first job as a guitar player with a Rock ‘n’ Roll singer called Marty Wilde. I could not believe that he gave me the job as his guitar player. Then, it was a baptism by fire – I had to do it and take that role. Still, I can only engineer what seems right for me. And for me, it’s usually about simplicity and melody lines. It’s not about technique for me. SPAZ: For the first time ever, you performed the 1970 Moody Blues track “You Can Never Go Home” live. When pulling an obscure gem like that out of your catalog and adding it to your set list, do you have to go back and reacquaint yourself with that song, or does it just come back to you naturally? JUSTIN: It’s somewhere locked away in an automatic place in my memory. As soon as I started to think about the first couple of chords, it all came flooding back to me. It’s always a dilemma when you return to things that you only ever spent maybe two days on in the studio to do originally and you haven’t ever played since – I haven’t even listened to them since. I remember where the emotional points were for that song and I remember what was going on in my life. It puts me right back in that moment. Music has that power to do that for people who just love music, as I do. It also has that power for writers as well. I remember what I was going through emotionally then – I was losing people and there was a lot of grief around my life. It was a difficult time for me, those early years of the Moodies. And to actually bring that back again, it’s worth remembering to value what there is now. SPAZ: You deliver every song – new and old – with such conviction and passion. How difficult is it to connect with a song like “Nights In White Satin” when you’ve probably performed it around 4,057 times? JUSTIN: “Nights…,” “Question” and “I Know You’re Out There Somewhere” are songs that the audience brings something to every night. They provide some kind of magic. You can’t expect to evoke a great emotion at a sound check – it’s when you start playing it, and you start feeling the atmosphere in the room of what it means in some peoples’ lives. It’s quite important to them, and they bring an emotional feeling into the room that is just wonderful and very moving. It’s not something you ever get tired of. SPAZ: For the compilation ALL THE WAY, was it difficult to choose which tracks you wanted to use to best represent your solo career? JUSTIN: I left it to a friend of mine, Mark Powell, who had a list of maybe thirty or forty songs, and we just had to decide which songs were right for the single CD version. I thought it was better to have someone else’s opinion because I was just too close to the material. 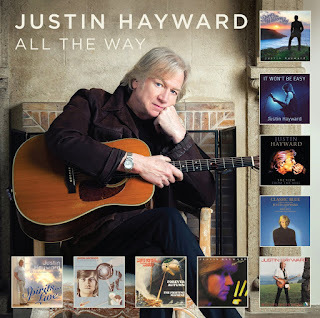 SPAZ: What’s next for Justin Hayward? JUSTIN: I don’t know what’s in the future. The Moodies are always being asked to tour. In fact, we are being offered more work now than we ever have been. I’ll see the other guys and see how they feel, what their priorities are. I will be keeping Mike and Julie with me, that’s for certain. Recording and working with David on "The Wind of Heaven" has been an absolute joy, so I'm hoping there will be some more new things coming. Love the questions that SPAZ asked. Justin is truly a legend. Screw the Rock and roll hall of shame. They and we don't need that "honor" to justify our love of the boys. Hooray! Great interview with a legendary singer / songwriter! I do love when he rips out a lead though -- definitely overlooked! I was impressed he was asked about his guitar playing. I'm always interested in that side of his (and others') work. I found his response to be enlightening and humble, though he is truly a master at doing more with less. I've always maintained the best guitarists are the ones who know exactly how much is needed for a song and not over do it. As an acoustic guitarist myself, I've always found inspiration in his work and play his songs often. I've learned so much from his playing. And, I look at his left hand! LOL It's enlightening to see how many variations can be written with a small set of chords. I love finger picking and pic work and he is an inspiration and example for me. His playing pushes me and for that, I'm grateful. Justin, you are a beautiful and gracious person. Did I forget genius song writer? I've been enjoying the You tube video of the group playing at a club in France. How fun. I wish I had been there. thank you for enriching my life. I have seen Justin 4 times in a small venue in the past few years and it is awesome. There are times when I wish he would play a few more classic songs of his and don't feel the need to hear Tuesday Afternoon and Nights every time. It surprised me when he said he had only played You Can Never Go Home a few times and not in a really long time. I would love to hear that live again and songs like The Actor and New Horizons and Blue Guitar and The Story in Your Eyes..... to name a few. But really I am just thrilled to see Justin preforming so well and hope he keeps coming. It's such a huge treat to see him up close. I agree with Deborah.... thank you Justin for enriching my life. justin hayward is one of those very few masters of their craft, a true and genuine artist from a by gone age who has so much love for his genre that he has matured his sound and playing with infinite grace and outstanding precision. there is no one in mankind's history that has sounded consistently for over fifty years like a real angel in heaven. in fact, justin, i would like to thank you for bringing heaven to earth with your songs and your consummate artistry. your dad would be very proud of you and your unique accomplishments in the field of entertainment and art you will always stand out as a timeless master of music. i predict that your songs will be as popular and as fresh as they sound today, even a hundred years into the future. 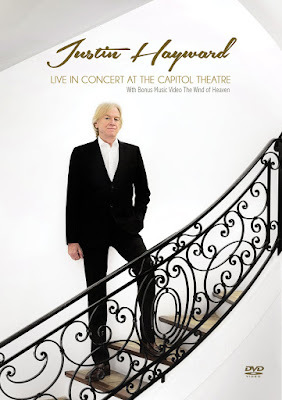 for those few people on the planet who have not heard of you or the moodies, they are in for a truly memorable experience when they catch up with and appreciate the vocal and song-writing pure genius that is justin hayward. thank you again for being such a wonderful role model in my life.